Hanoi (VNA) – The annual “Xuan Que Huong” (Homeland Spring) programme, a run-up to the Lunar New Year festival, was held in Hanoi on January 31with a string of cultural activities for overseas Vietnamese (OVs). President Truong Tan Sang joined Deputy Prime Minister and Foreign Minister Pham Binh Minh; Chairman of the Hanoi People’s Committee Nguyen Duc Chung; and representatives of diplomatic corps, international organisations and OVs at the event. Addressing the programme, the President highlighted Vietnam’s major achievements in various fields, attributing these achievements to significant contributions made by Vietnamese abroad. Apart from marching together with their homeland, the OVs have also joined hands in building a united community and integrating into their host countries, the leader noted. 2016 is an important year, as it is the first year of actualising the 12 th National Party Congress’s Resolution and the Socio-Economic Development Plan for 2016-2020, he said, adding that the election of deputies to the 14 th National Assembly will also take place this year. The President also pointed out opportunities and challenges stemming from complicated regional and global situations, globalisation and international integration. Given this, he called on Vietnamese at home and abroad to unite and work harder for the cause of national construction and defence in order to turn Vietnam into a wealthy country. 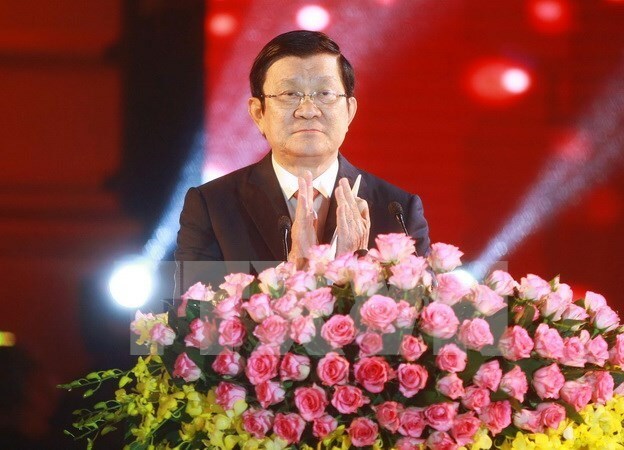 President Truong Tan Sang used the occasion to thank foreign Governments and people for supporting overseas Vietnamese as they work to stablise their lives and integrate into their countries. The State leader and representatives of the OVs burnt incense and released carp at the President Ho Chi Minh Relic Site. Hosted by the State Committee for Overseas Vietnamese Affairs, the Foreign Ministry and the municipal People’s Committee, the “Homeland Spring” programme has become an annual event anticipated by OVs who return home for Tet. Vu Quoc Trung, a Vietnamese in Austria, noted his joy at seeing changes in his home country, especially when it came to new foreign investment. According to Trung, about 7,000 Vietnamese in Austria turn their hearts toward the homeland through art and charity programmes. Trung expressed his belief that the newly concluded 12th National Party Congress will create breakthroughs for the country’s development, and that under the leadership of the Party and State, Vietnam will thrive. Returning from Thailand, Vu Quoc Loi voiced his hope that Vietnamese in the country continue to work as bridge, enhancing the friendship and cooperation between the two countries. Vo Thi Thanh Tuyen, a Vietnamese in the US, said Vietnam has affirmed its important role and position in the international arena and the Asia-Pacific region, noting her hope that the country will integrate more deeply into the world.